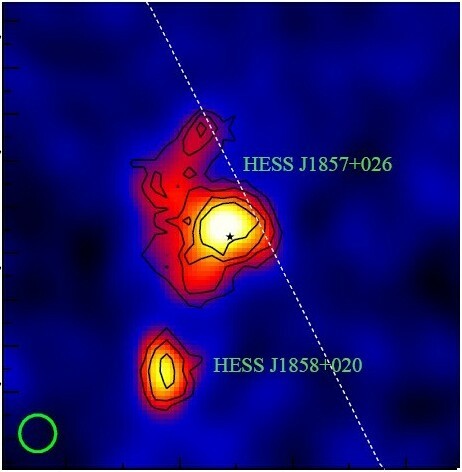 The very high energy gamma ray source HESS J1858+020 is located about 0.6 degr. off the Galactic plane, which is indicated by the dashed line. The color indicates the strength of the gamma-ray emission. The green circle illustrates the point spread function of the instrument. HESS J1858+020 is among the sources discovered by H.E.S.S. in its survey of the Galactic plane. Unlike most other sources, HESS J1858+020 represents a rather compact emission region of about 5' in size. Is features a relatively hard gamma-ray spectrum, extending beyond 10 TeV. Lacking any obvious counterpart, the source was classified as "unidentified" at the time of the discovery. 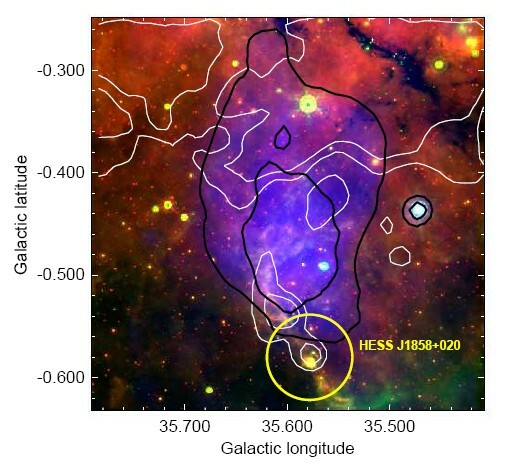 New clues regarding the nature of HESS J1858+020 come from two recent publications: Green (2009) reports on the re-classification of the extended radio source G35.6-0.4 as a supernova remnant, based on VLA radio data at 1.4 GHz which resolve the source, based on the non-thermal spectrum of the radio emission, and based on the lack of infrared emission. G35.6-0.4 (Fig. 1, Fig. 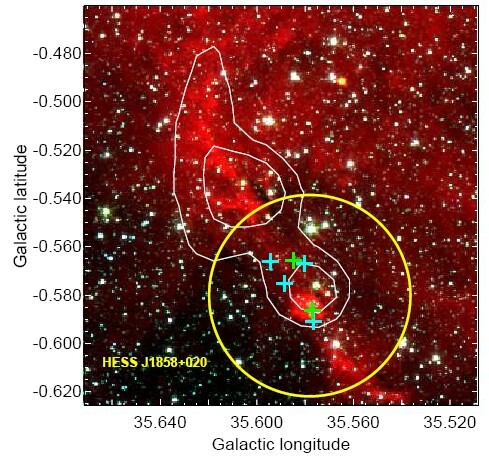 2) extends from the location of HESS J1858+020 towards the Galactic plane. Green (2009) estimates the age of the remnant to about 30000 years, and its distance to about 10 kpc, both numbers with large uncertainty. Paron and Giacani (2009) report the presence of a molecular cloud of about 5000 solar masses at edge of the remnant G35.6-0.4, coincident with the H.E.S.S. gamma-ray source (Fig. 2, Fig. 3). The cloud is visible in 13CO radio data, selecting a velocity range 51 to 59 km/s, corresponding to the estimated distance to G35.6-0.4. The implied scenario is then a supernova remnant which illuminates a nearby molecular cloud where gamma rays are produced by interacting protons accelerated in the remnant (e.g. Gabici et al. 2009). The emission from the remnant itself is too faint to be detectable, but the 5000 solar mass cloud boosts proton interaction rates. If this interpretation is correct, the system would demonstrate proton acceleration by supernova remnants. However, an alternative explanation could be the formation of massive stars inside the cloud, which in their various stages of evolution could also accelerate particles. Analyzing Spitzer infrared images, Paron and Giacani (2009) indeed find evidence for star formation inside the cloud (Fig. 3). Fig. 1: VGPS 1.4 GHz radio image of G35.6-0.4 (the lower extended object; the bright region near the top is the thermal source G35.5-0.0). Note that this and the following images are in Galactic coordinates, whereas the top image is in RA-Dec coordinates. From Green (2009). Fig. 2: Three-color radio / infrared image of the region of G35.6-0.4 (red = 8 mu IR, green = 24 mu IR, blue = 20 cm radio emission). The black contours delineate radio emission from the remnant G35.6-0.4. The white contours show the density of molecular gas, traced by its 13CO radio emission. The yellow circle indicates the location and approximate size of HESS J1858+020. From Paron and Giacani (2009). Fig. 3: Zoomed-in three-color infrared image (8 mu, 4.5 mu, and 3.6 mu) of the vicinity of HESS J1858+020; the gamma-ray source is indicated by the yellow circle. 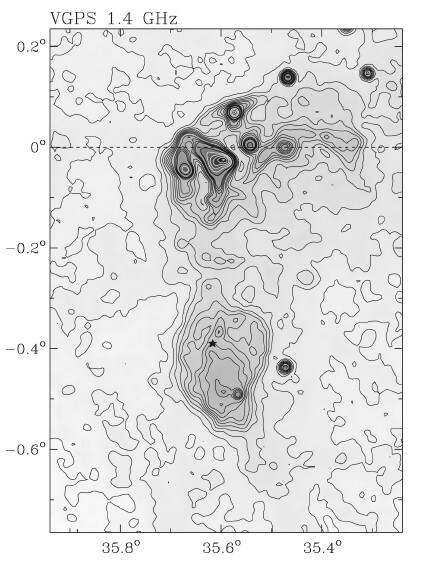 The white contours again show the density of molecular gas, traced by its 13CO radio emission. The crosses show star-formation candidates, identified by their spectra. From Paron and Giacani (2009).